Preschool Playbook: Fun At The Beach....At Night! Look closely, can you see him? I've had the information for this post since June, but I couldn't find the time to get the post done. Unbelivably, it is now near the end of summer, I just can't believe it! Sorry for the late summer activity. I wanted to share this with the many people that head down south to the beach for some fun and relaxation during the summer months. My family lives in Pennsylvania and has been traveling to the Virginia Beach/Outer Banks areas for our summer vacations. Our first experience with this activity happened many years ago by accident, we just "stumbled" upon it on an evening walk, my children really enjoy it. This activity is not for the weak of heart or for anyone that does not like spiders. It's really not that scary, but here it is: Crab Catching. Yes, catching crabs, not with cages, or nets, but with hands, and they do use buckets. What happened, is that one evening we decided to take a walk on the beach. As we were walking we saw all these "movements" everywhere. 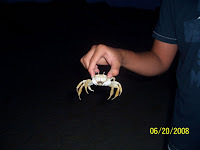 The next night we brought our flashlight and found that all these "movements" were crabs. They were EVERYWHERE! Most of them are little crabs, but there are some big ones. 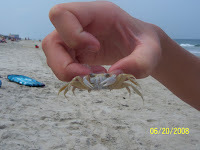 Anyway, my kids love to catch these crabs, even my youngest. The youngest can't always catch them, but he loves to pose with them. They can not wait for the first evening of our vacation so they can go catch crabs. They have even perfected a technique that hypnotizes the crabs--they really seem to go to sleep. We don't really do anything with the crabs: catch them, get their pictures, then let them go. They caught this one during the day. If you look closely, you can see he is "sleeping." I myself have never actually had the nerve to catch these wonderful sea creatures. I am much more happy just to be the camera clicker. They, though, love it. I can't give you specific techniques. I can just tell you what I see. Catching a crab can take some time as they can be very quick. Usually one person keeps the flashlight on the crab while the other "chases" it. My daughter usually covers the crab with sand. 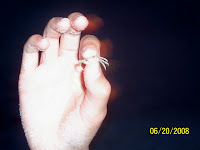 Then goes to the crab from behind it, picks it up from the back placing her fingers somehow to get the crab to "sleep." The first crab of the season usually takes the longest to catch, but once the kids are back in the groove "catching" gets quicker. I know this might not be an activity for everyone, but if you've never gotten to the beach for an evening walk with your children, this is something you might want to give a try. It has become a tradition for us--as crazy as that sounds. It is a part of our vacation that our children can not live without.